So here's how far we've got with the lounge. 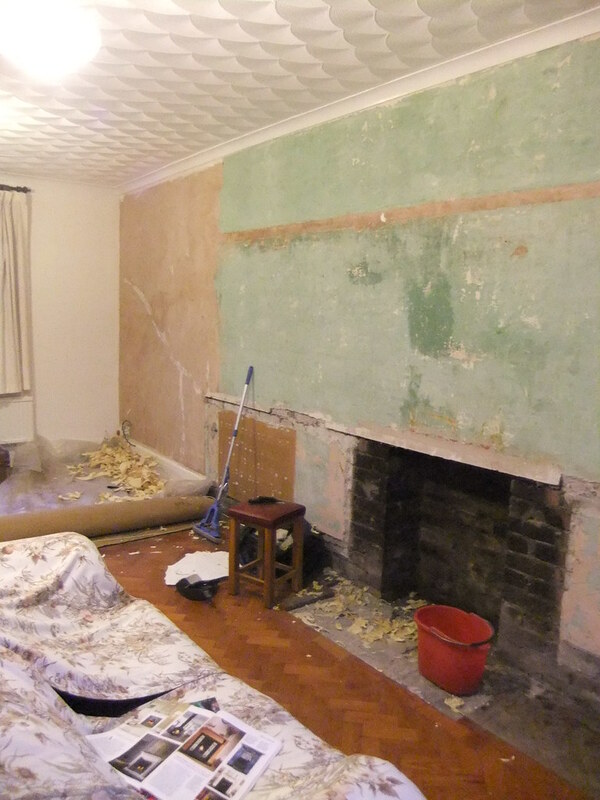 That lovely thick '60s style wallpaper is now stripped off (it had to go, sorry to those of you that liked it!!). The uneven concrete in the fireplace has been chipped out, and we've laid new cement there to give a nice even surface for when we put down a new hearth. 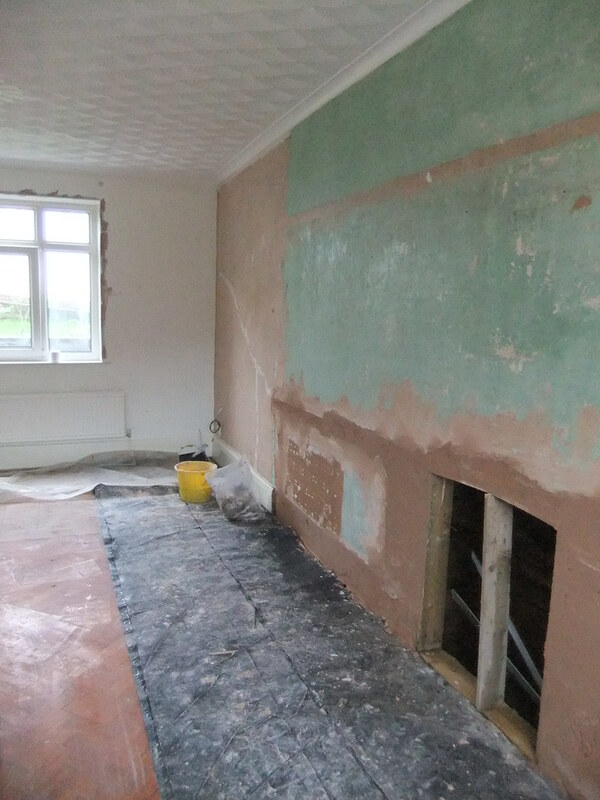 The room has been prepped for plastering, with holes filled, and the shape of the fireplace opening properly revealed (I like the slightly curved top, I hope we can keep it). 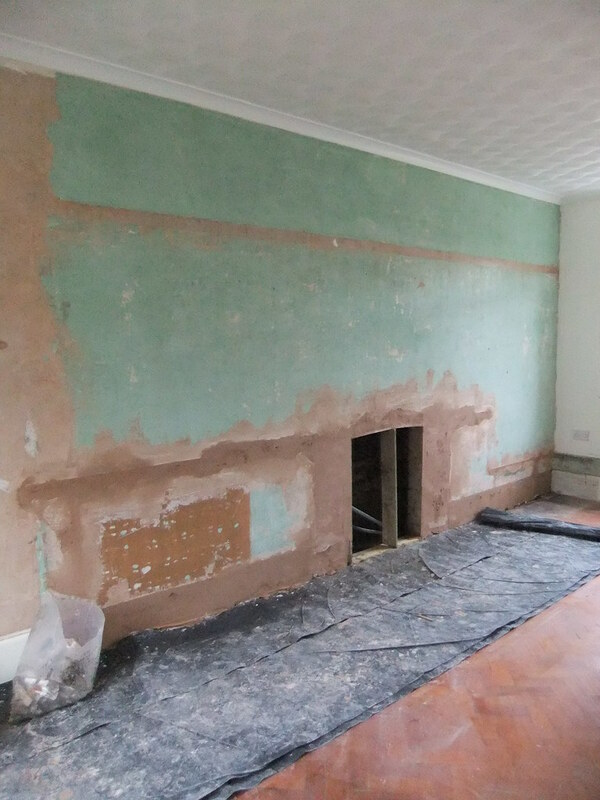 This is the lovely artexing of the walls that we want the plasterer to skim over. 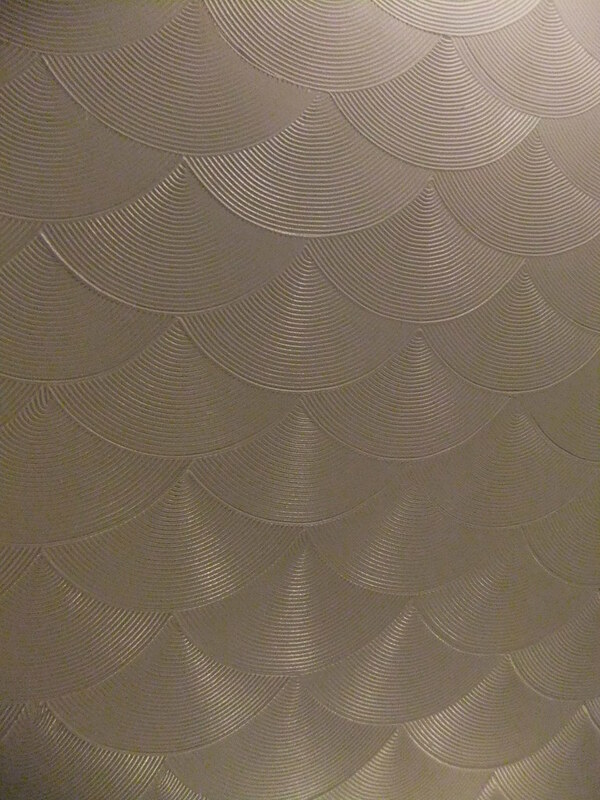 Though we're keeping the artex on the ceiling because the fan/shell pattern is a bit Deco. 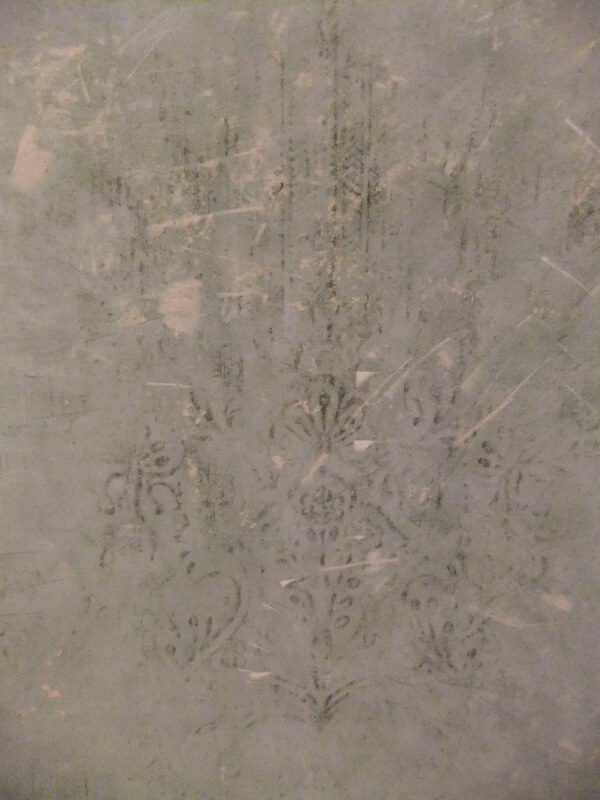 It seems there would have been a dado rail in the '30s originally, and in some parts we can see an imprint of an earlier wallpaper. 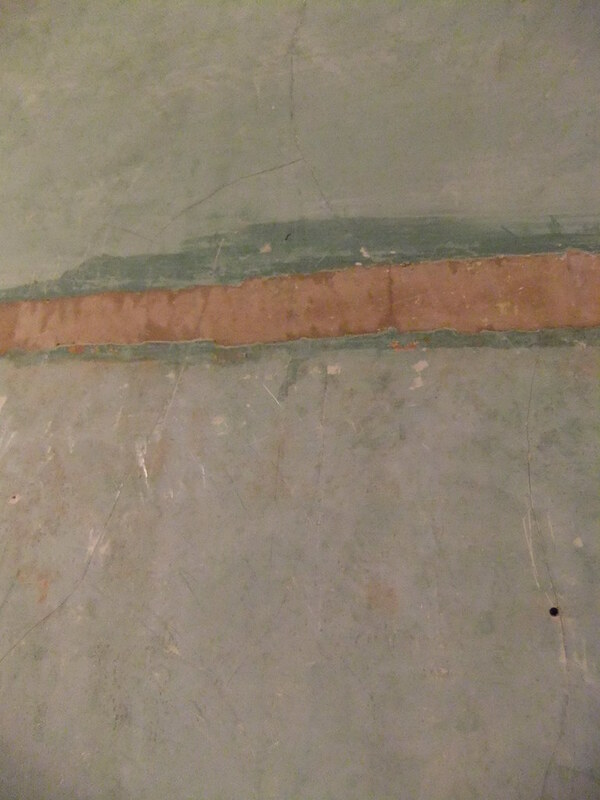 It's also been revealed that our walls are really quite wonky, and especially wonky in the 1970's extension part rather than the original 1930's part. It wouldn't surprise me if they made the walls out of lego and newspaper, which seem to be the building materials of choice from what we've unearthed so far. 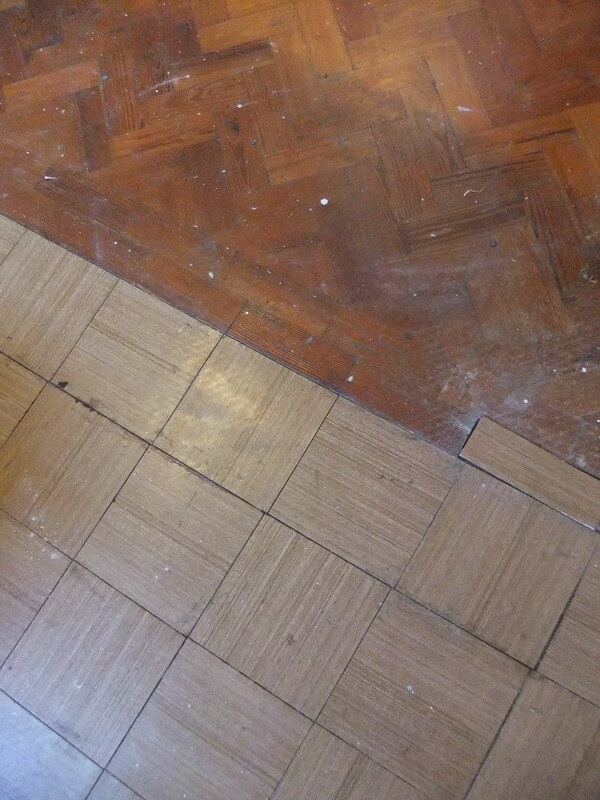 The other rubbish bit about the 1970's extension, is that instead of continuing the beautiful parquet flooring, they put down some really cheap looking lino. It's awful. We did think about a quick-fix, keeping that bit covered with carpet, and having an edging strip put in. 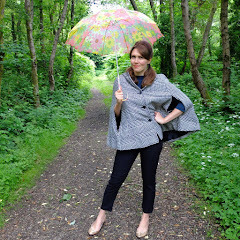 Or maybe just covering it with a nice rug for the time being. We were pondering this as we were driving around builder's merchants on a day of DIY missions. 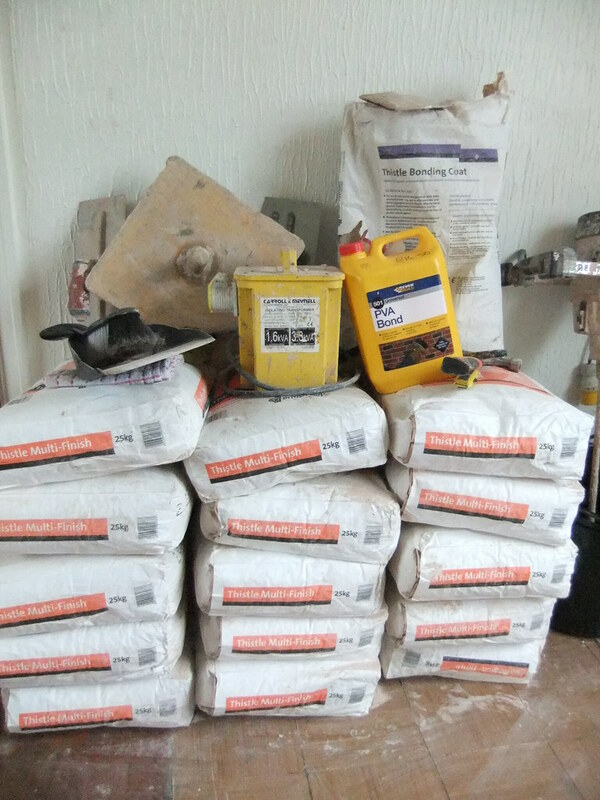 Impressively, we managed to get 400kg of plaster in the back of a Nissan Micra. (I say 'we', but each bag weighed 25kg so my role was more supervisory...) After lugging all of that into the house, along with all kinds of other plastering paraphernalia, we headed out again to buy our woodburning stove and some loft boards. Back to the house, and I looked on Gumtree for rugs for something to cover up the lino, and inadvertently found a man selling a load of parquet flooring that he'd dug up from the kitchen of his 1960's bungalow. 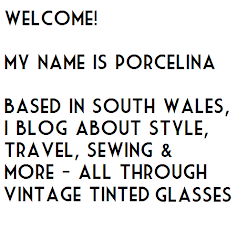 It seemed from his photos that it was a near perfect match for our 1930's parquet, so off we went again, which involved driving over the top of the mountains in the dark and the fog, and getting quite lost in Merthyr. Eventually we tracked down the bungalow and loaded up the parquet, which was a bargain really, as we got about 10 square metres for £50. So, now we have to add 'laying new parquet' to the list of things to be done to finish the lounge for Christmas. This isn't just a case of pulling up the old lino and sticking down the parquet, oh no, because of course, the lino is much thinner than the parquet, so we will first need to dig out the concrete to get the right depth. Things are never simple. 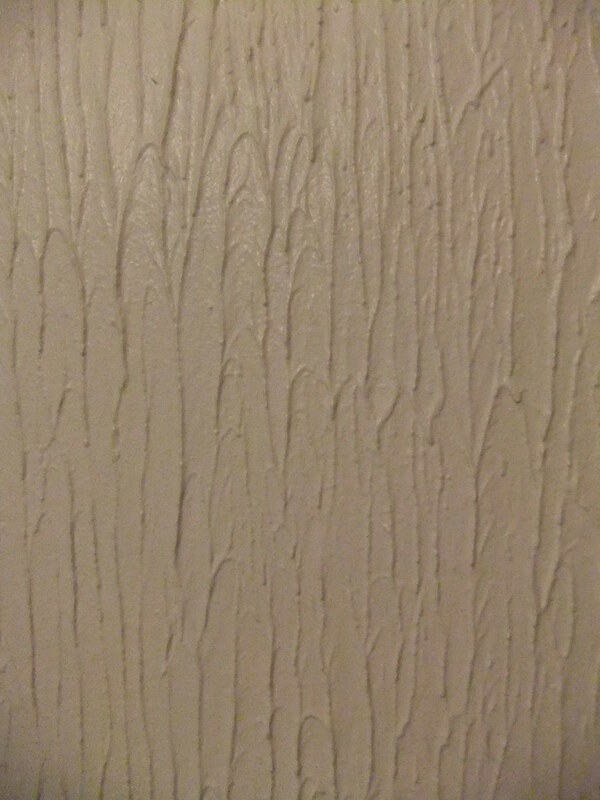 We've also abandoned the plan to take the radiators off and plaster behind them, because our attempt at removing one of the radiators yesterday resulted in water spraying everywhere... It seems that because they're old radiators, some of the valves are 'stuck', and we couldn't take them off without 'draining down' the whole central heating system, which is far too much hassle on top of everything else. The pressure's on, only 32 days until Christmas! Wow, so much work! It's great seeing your progress though. Also, what a lucky find the parquet flooring. I can't wait to see what happens next! Jon did the labouring for the handymen we got in, it saved loads of money and he learnt loads, too! Chris is really keen to learn as well, he's been hovering around the workmen. I think a can-do attitude is brilliant. My Dad built a bungalow once, and he didn't have a clue when he started, just learnt as he went along, so I take that as evidence that it's all doable!! I think you're right about timescale too, lots of people seem in a rush to do things. We need to save up a bit at a time, but I like being more thoughtful about it rather than making snap decisions. Bargain parquet! That was a good find. I hope the labourer turned up in the end. That is a crazy amount of work! But all the headaches will definitely be worth it once the house if done and beautiful and feels like *your* place. Also, my boyfriend is a rare American rugby nut, and stayed up crazy late to watch that same match. Love the deco ceiling and your pretty parquet flooring, I hope the tiles you found work out ok. Digging out the concrete sounds like a bit of a nightmare, are you going to have jackhammering in your house or something? How cool that your man loves rugby! 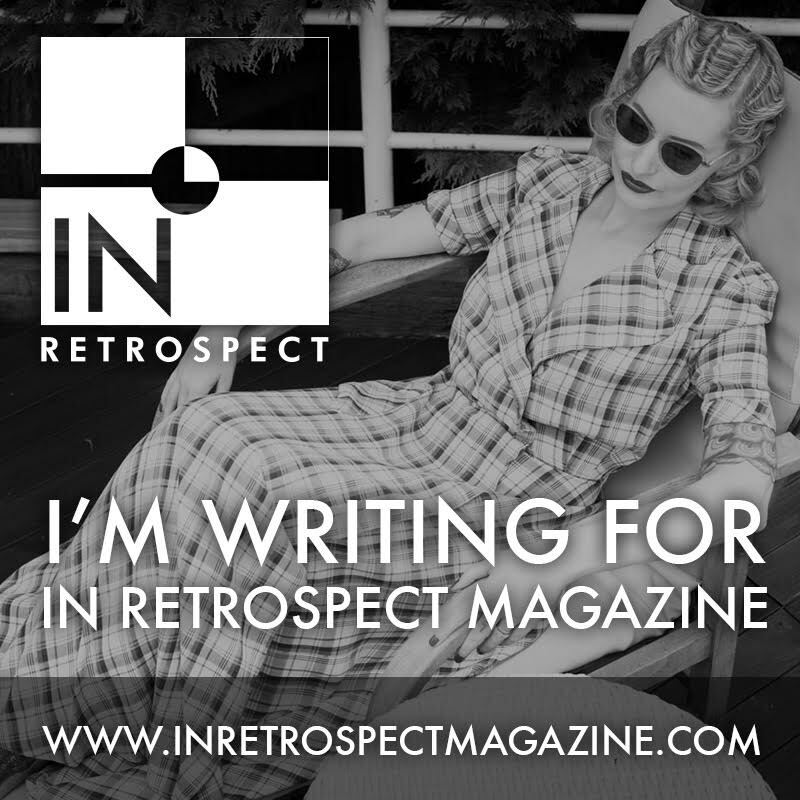 We do indeed want to do it properly so are conscious of not rushing it. Chris is self-employed and is donating his time on this, as we would never get it done in time just working evenings and weekends! Wow! Talk about impressive! And I have faith in you to get it done for the holidays! My gosh, that is such a huge amount of work and quite the pressure to be under, too. You guys are doing amazing on the reno front! I really can't doff my hat enough in your direction. Well done on the parquet I love it when you find unexpected bargains like that, what a result! I suspect your room would have had a picture rail, a standard feature of houses up to the 1930's it looks to be about the right height.